The Oviraptor was famously misnamed because in 1924, an Oviraptor fossil was found in Mongolia on top of some fossilized eggs, and people assumed that it had been eating the eggs. However, recently in Mongolia, paleontologists found some eggs containing fossilized embryos that were identified as embryonic Oviraptors. 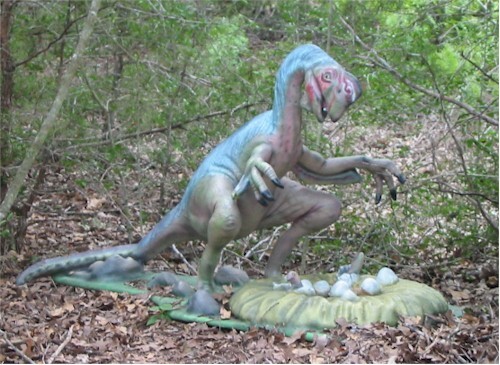 These eggs were very similar to the eggs found in 1924 that originally implicated the Oviraptor as a thief. It would seem that the Oviraptor fossil in 1924 was probably a parent of the eggs in the nest, and not an egg stealer but a nurturer. Oviraptor was an omnivore who used its powerful beak and jaws to eat meat, eggs, seeds, insects, and plants. Oviraptors were bipedal (walked on two legs). Oviraptors had long legs and were light-weight, so they were probably capable of running fast. Oviraptors had a small, stumpy, horn-like crest on its snout, probably used for a mating display; differences in these crests may represent different species or the difference between the male, female, and juvenile of the species.